Pigs are known for their appetites, and they have a collection of favorite foods to match. However, just like humans, pigs need a complete, well-balanced diet in order to stay well and avoid unhealthy weight gain. While feeding your pig a sugary treat or human leftovers now and then might sound tempting, giving her the occasional tasty, nutritious snack instead is a far wiser option. A good portion of your pig's diet should be composed of grains, which will typically be found in the pig feed your provide her. However, grains can also be a part of the nutritious treats you give your pig. Healthy grains can be found in all-natural crackers, bread and cereals that don't have any added salt or sugars. Whole-grain popcorn is a tasty, suitable treat for pigs as well, so long as it's unbuttered and unsalted. In addition to a healthy diet of grains, pigs must eat a daily salad of fresh vegetables. While vegetables are an essential nutritional requirement for a pig's everyday diet, they can also serve as delicious snacks. Dark, leafy greens, like kale or spinach, are perfect for pigs, providing ample amounts of vitamins. Other healthy vegetables snacks for pigs include bean sprouts, beets, broccoli, butternut squash, carrots, cauliflower, cucumbers, parsnips, peppers, pumpkin, summer squash, turnips, winter squashes and zucchini -- or any other fresh vegetables you can find at the store or farmer's market. Fruits are an especially delicious treat for pigs, but one that should be given only occasionally. Because of the sugar content found in fruit, pigs should only be fed one or two small portions of fruit a day as a treat. Small pieces of fruit can also be used as a reward if you're attempting to train your pig; she'll love the sweet prize. 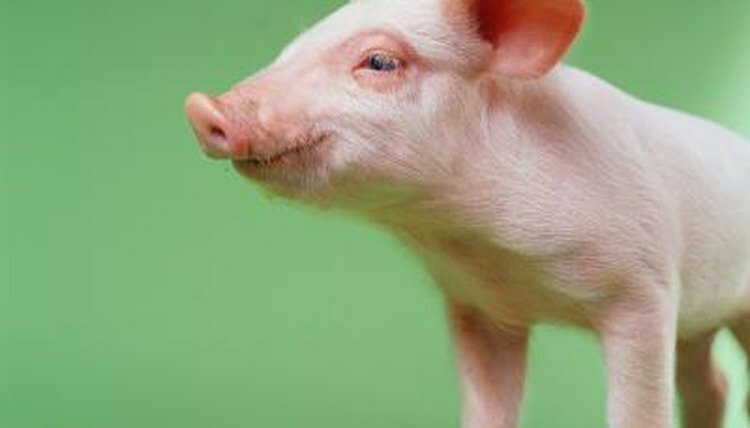 Pigs are able to eat a wide range of fruits, so long as it's in moderation. Give your pig opportunities to try a variety of fruits -- from bananas and apples to oranges and pears -- to see which she likes best. Pigs will happily eat a wide variety of foods -- even those that are not healthy for them. Some owners have been known to give their pigs snacks like cat or dog food, cooked leftovers or sugar, all of which are unhealthy and unacceptable for pigs, according to the North American Potbelly Association. Other unacceptable snacks include salt; meat, poultry or fish products; chocolate; milk products; and canned foods.